The third EU-Iran High-level Seminar on International Nuclear Co-operation: Achievements and Prospects was held in Brussels on 26-27 November 2018. The seminar provided a platform for follow-up of the two previous seminars, including fruitful high‑level exchanges on how to advance peaceful nuclear co-operation, as foreseen under Annex III of the Joint Comprehensive Plan of Action (JCPOA), which makes an essential contribution to the successful implementation of the overall JCPOA. 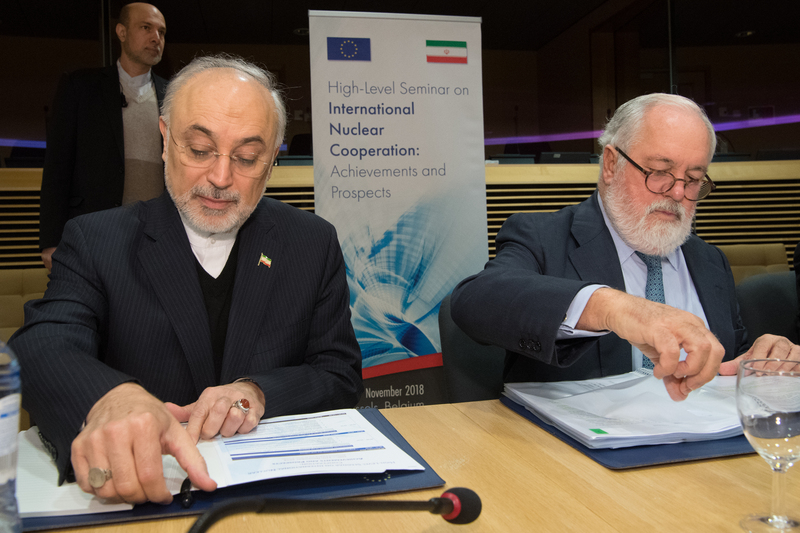 The seminar was opened by Commissioner for Climate Action and Energy, Miguel Arias Cañete and by Ali Akbar Salehi, Vice-President of Iran and Head of the Atomic Energy Organisation of Iran (AEOI). During the opening session, Helga Schmid, Secretary General of the European External Action Service, and Abbas Araghchi, Deputy Foreign Minister for Political Affairs also intervened. Senior level representatives from the European Commission's Joint Research Centre, International Co-operation and Development, and Research and Innovation also presented their contributions to the implementation of Annex III of the JCPOA. Other participants included Members of the Iranian Parliament, senior representatives of the AEOI, the Ministry of Foreign Affairs of Iran, the International Atomic Energy Agency, observers from E3+2 countries, as well as a number of scientists and engineers. Opening the seminar, Commissioner Arias Cañete emphasised the importance that the EU attaches to the implementation of the JCPOA, noting that the agreement has been unanimously endorsed by the United Nations Security Council Resolution 2231 (2015). He added that the EU remained committed to the continued full and effective implementation of the nuclear deal in all its aspects as long as Iran continues to implement its nuclear-related commitments in full, as confirmed by thirteen consecutive International Atomic Energy Agency reports. Preserving the JCPOA is a matter of respecting international agreements and a matter of international security. Vice-President Ali Akbar Salehi stressed that the content of Annex III of the JCPOA reflects the concurrence of minds and the final agreement of the parties on the approaches and measures needed to implement the agreement. Both sides highlighted the importance to continue the implementation of the JCPOA, including through concrete progress on Annex III. Both parties recalled examples of EU-Iran co-operation in the civil nuclear field including: frequent high-level exchanges on policy matters pertaining to civil nuclear co-operation; a joint workshop on civil nuclear liability and insurance; projects that support the efforts of Iran's Nuclear Regulatory Authority to align with international standards in the legislative and regulatory field; scientific seminars and technical visits to nuclear sites and laboratories of the EU Joint Research Centre; international conferences with stakeholders in the nuclear field; projects in support of the modernisation of the Arak research reactor (Khondab), and the conversion of the Fordow facility into a nuclear, physics, and technology centre. Seminar participants also identified a number of future joint activities related to the nuclear governance framework, as well as research and training related to nuclear safety and radiation protection based on an agreed calendar. These activities will include the organisation of seminars on nuclear law and on reporting under the Joint Convention, participation to key European nuclear stakeholder conferences, sharing of experience and methodology for performing nuclear stress-tests, enhanced collaboration in the field of R&D, a further package of safety related projects financed under the Instrument for Nuclear Safety Co-operation, as well as organisation of a stakeholders’ conference to leverage international support for the establishment of the Nuclear Safety Centre. Participants also agreed to continue to implement the agreed roadmap on R&D co-operation, including a joint project on radioactivity measurement capabilities. The seminar reconfirmed the existing understanding that international nuclear co‑operation and nuclear governance are important elements which should be developed in parallel in order to optimise benefits for all sides. Both the EU and Iran expressed their satisfaction at the progress achieved so far in the areas of nuclear co-operation and governance. They agreed to hold a follow-up high-level seminar to be organised by Iran in 2019.